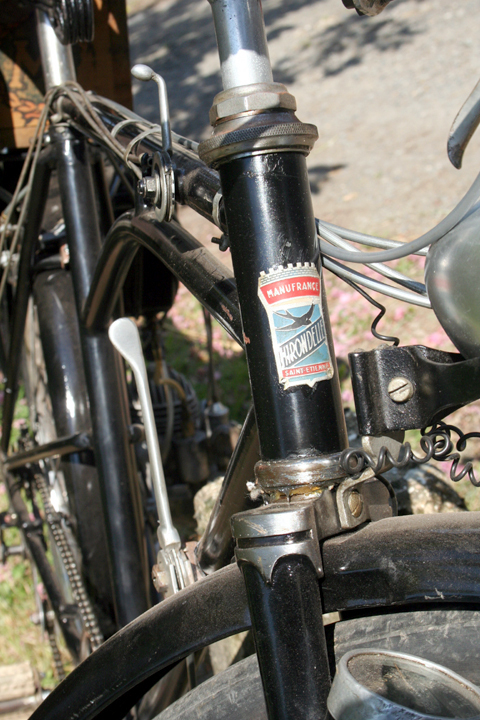 The Manufrance Hirondelle was the preferred mount for the VAP4 engine. As you can see in the advert above and the photo below, it certainly is both a handsome and a sturdily-built frame that suits the engine well. Between the Loire and the Rhône, Saint-Étienne, until the second half of the 20th century, was one of France’s most important industrial centres. You could compare it with Britain’s Midlands industrial centre around Coventry, Birmingham and Wolverhampton. Creation of the legendary ‘Manufacture des Armes et Cycles Manufrance’ (1885). The advert below dates from 1910. 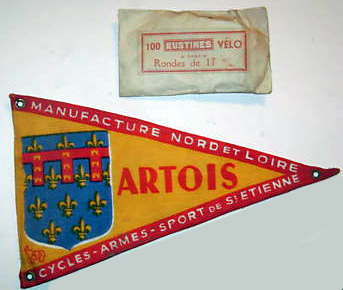 The Manufrance name means ‘Manufacture Francaise d’Armes et Cycles.’ The company was established to manufacture armaments as well as bicycles, which was quite common in the early days of cycling (similarly, of course, ‘BSA’ means ‘Birmingham Small Arms’). 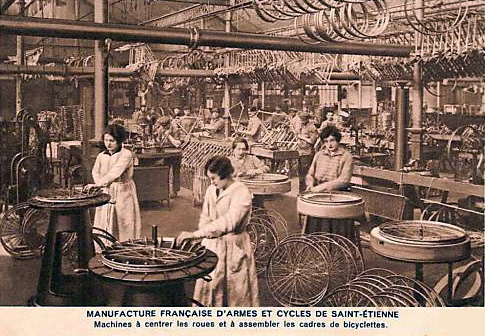 The Gauthier brothers started making Manufrance bicycles in 1885. This was France’s first modern bicycle, and Manufrance Hirondelle bicycles were used by the policemen of Paris. Manufrance sold a wide variety of goods through their famous catalogue. The pictures above and below illustrate a 1910 edition. Their first motorcycle they advertised (below) was in 1910. Although they offered various models, they didn’t start full-scale production of powered 2-wheelers until after WW2. Their 1948 catalogue advertised the VAP attachment on a Manufrance cycle (see top of page and below). The VAP 4 was a more powerful engine than its predecessor, the VAP 3. Unlike many cycle-attachments, it will actually propel you uphill. Hence an ad campaign proclaiming ‘Porquoi Pedaler’ (‘Why Pedal’), making fun of competitors, most of whose engines required pedal assistance on a gradient. 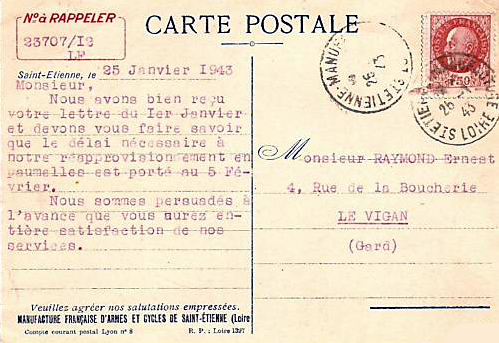 The 1951 VAP4 Manufrance Hirondelle is now equipped with items available at the time from the Manufrance Catalogue, to enable its use for roaming the countryside and killing small mammals. …which is attached to a Manufrance box for transporting your dead things. Mind you, this set up does presuppose that you are endowed with more than the usual allocation of hands. Look at all those controls! There are knobs, levers, controls everywhere. 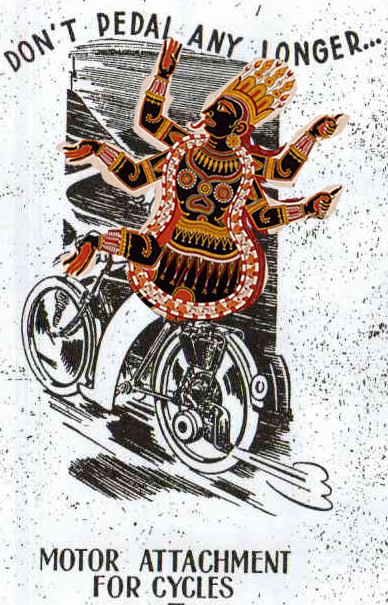 You need to have at least as many arms as Kali the Indian Goddess just to steer, brake, accelerate, engage, disengage, draw in the clutch, change gear …never mind pulling your rifle from its holder and picking off innocent creatures as you motor around le pays.